Green roofs and green walls are growing in popularity throughout the world, and for good reason. This eye-catching synergy of nature and cityscape is redefining how we think about planning and is directly tackling the issues around our urban heat island effect. You might’ve seen these green blankets seemingly grow out of the tops or sides of buildings, but you might not have thought about why designers choose to implement these designs. Not only does the enhanced aesthetic grab the attention of a passerby, but these urban mosses also provide plenty of benefits to the wider community. We’ve previously covered how designers use green roofs and walls to sustain vegetation, and how importance must be placed on selecting the right drainage solution to manage stormwater. The beauty of green roofs is that they can be customised depending on the level of maintenance required, the types of vegetation, the landscape desired, the existing structure of the building, and more. Intensive roofs are generally over 200mm deep. Their large capacity means they can sustain high volume of growth and water intake. These roofs require a stronger roof structure to support substantial vegetation, but they only require the same level of maintenance as a garden on the ground. Extensive roofs are less than 200mm in depth, are easily retrofitted to existing buildings and they come with a lower price tag. While vegetation is generally limited to low, shallow-rooting and groundcover plants, they are low maintenance as the vegetation selected can tolerate drought, wind and temperature fluctuations. Green roofs and walls help keep energy costs down by boosting the lifespan of the roof and providing better insulating sound and temperatures all year round. Studies have also have noted psychological health benefits on top of environmental benefits – people are happiest when there’s more biodiversity in their immediate environment. In other words, some green between dreary gravel and asphalt offers a community space to unwind, de-stress, connect with others and feel closer to nature. But perhaps the best motive for breaking up our concrete jungles with an injection of lush greenery is what it will do for our climate and surging populations. The more green roof and green wall initiatives throughout the world, the more we can improve the climate responsiveness of our society and minimise health risks in a sustainable way. Green walls and roofs are starting to take over the world. In Brooklyn, the New York City Economic Development Corporation (NYCEDC) has unveiled its plans to transform two film and fashion warehouses into a green-roofed production hub. In Europe, certain national and city governments mandate the use of green walls and roofs. Closer to home, the idea is latching on in Sydney and Brisbane, where in 2007 the Brisbane City Council included green roofs in its proposed action plan for dealing with climate change. Additionally in 2014, the City of Sydney pushed for more green by introducing groundbreaking new policy for green roofs and walls implementation – a first for our nation. But, for the most obvious place to implement greener policies, you only have to look at China. Last month, The Guardian unveiled radical new plans for ‘forest cities’ in China’s most polluted cities to stop one third of smog driven deaths in the country. Green cities can absorb heat and lower the ambient temperature, reducing the urban heat island effect and filter out damaging pollutants in the air. Italian architect Stefano Boeri likens his plant-covered vision to the architectural equivalent of a skin graft, hoping to stop metropolises choking on a toxic diet of fumes and dust. With Chinese officials finally ready to embrace new ideas to tackle the polluted air crisis, the green architecture covering schools, hotels and even museums will be a welcome addition. In fact, his practice posited that in the eastern city of Nanjing, the cycle of plant photosynthesis would allow the greenery to absorb around 25 tons of carbon dioxide (produced by urban traffic per annum) and feed out around 60 kg of oxygen every day. Realistically, we know it will take more than a few skyscrapers to eradicate the nation-wide epidemic, but green roofs and green walls is a positive step forward to cleaning our air and reducing our toxic footprint. While plenty of designers are getting involved with this sustainable idea, it is critical that the right drainage product is installed before green roofs or green walls are planted. It is vital to drain a green roof during storm events, yet keep soil, gravel and sand moist to promote healthy vegetation growth. Designers specifying insufficient drainage systems can damage the structural integrity of the building, as well as the longevity of the plants. To protect the waterproof membrane of a building and let the greenery work its magic, the drainage product needs to be selected to capture the stormwater runoff effectively and also capture subsurface drainage. Fortunately, ACO has pioneered a unique product to tackle the challenge of controlling water drainage on green roofs. ACO ProfiLine is a unique surface and subsurface drainage system that works in harmony with green roofs or balconies. 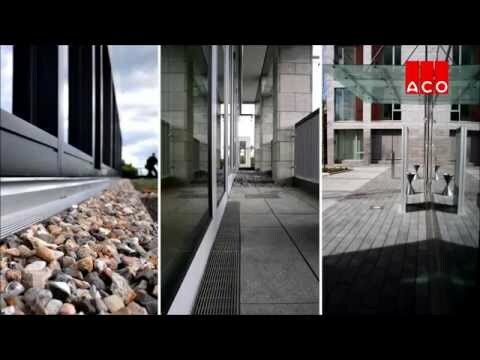 The ProfiLine system drains water directly from the surface or façades via a linear channel and range of grates, including the 5 Star Heelsafe® Anti-Slip for pedestrian safety. The side wall of the channel feature perforations to allow water to enter and exit the channel beneath the surface, managing the stormwater effectively on a green roof. To overcome the negative impacts of increasing urban environments, ACO are committed to developing new technologies to deal with stormwater effectively and are a member of Green Roofs Australasia. Waterproofing and drainage play a key role in the effectiveness of a green roof or wall and ProfiLine is the product to help designers specify with confidence drainage that will enable their green roof to flourish. If you’re interested in the ACO ProfiLine range, talk to us today. Call us on 1300 765 226, +61 2 4747 4000, visit www.acobuildline.com.au or email sales@acoaus.com.au.